So scanning around Facebook I found a community of very talented artists! I have never seen such amazing styles and coloring! So here I am freely advertising their pages! Members/Artists can ask for commissions,help, and other such things from Anime,Comics, and other medias! You can get anime,cartoon, and other style of arts as well! What facebook group is this with so many talented artists? It's Anime Artists ( Anime Artists ) so Join and have whatever art you want commissioned! 1. Do not attack the artists! show respect for them and their work! 2. Do not spam them! have the common courtesy to be patient and wait! they have lives as well! 3. If there is a payment involved pay them! Do not scam them! 4. Like their page and share their art! Help the artists out! 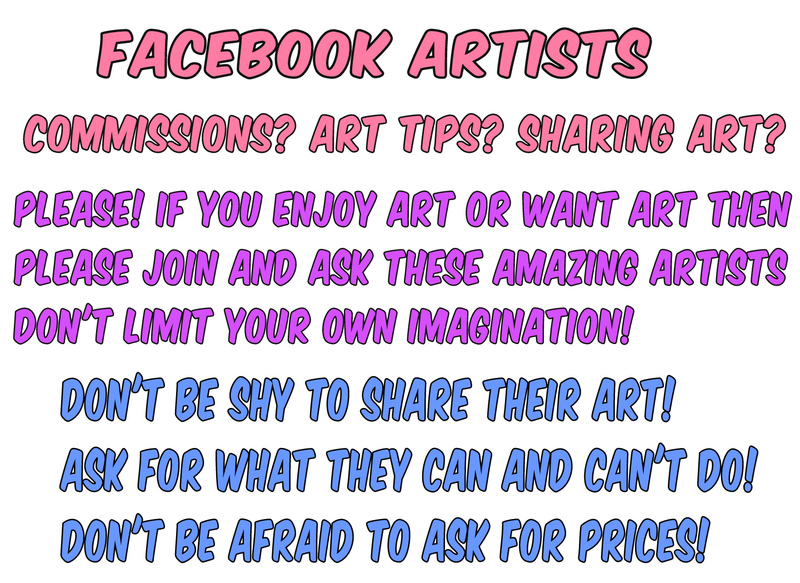 Warning: If artists feel like their page shouldn't be listed then message me here or on our Facebook!